Candice H. Brown Elliott is an internationally recognized leader, entrepreneur, executive, and technologist / inventor in the flat panel display and microelectronic industries. She is a regularly invited speaker at international conferences, industry symposia, and universities. She has held engineering and managerial posts in leading semiconductor firms as well as start-up ventures. She has founded several technology companies and led industry research consortia programs. Candice has over a hundred US patents issued, with more pending. She was awarded the Otto Schade Prize for her work in color displays, particularly PenTile subpixel rendering. In her over forty year career, she has served in nearly every capacity from secretary to CEO / Chairman of the Board. 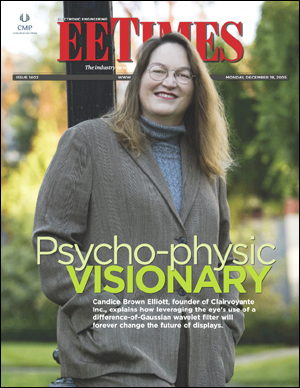 Candice is a prolific writer, mostly non-fiction essays on technology and science, including a chapter in the SID textbook, Mobile Displays. Using her pen name “Seaby Brown”, she has just published her first science fiction novel, All the Stars are Suns. Candice grew up in Silicon Valley (Sunnyvale and Los Altos, California) where she was imbued with the entrepreneurial and innovative spirit. She has two daughters, Elizabeth and Cassandra, both now grown. She and her husband, Jeff, live in Santa Rosa, California, where they are restoring the historic Comstock House. When not puttering in her half acre garden or finger picking out folk tunes on her mountain dulimer, Candice can be found at the local airport where she is a flight instructor (CFI, CFII, MEI). Candice owns and flies a Piper Cherokee and a Piper Aztec she uses to travel across America.